For a variety of reasons we haven't ventured to Old Trafford today - though we will be there in two weeks time for the semi-final against Chelsea. Also there will be this blog's flag, which was delivered during the week. 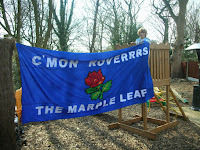 Parading it in the garden is Joseph, with aching limbs from a nail biting 2-1 win over Stockport Vikings. Good luck in the Semi against Chelsea. Had a great day at Old Toilet last season when we played Chelsea in the Semi. Wonderful stadium, good atmosphere as long as Manure aren't playing. Nice flag - is it one of barmy charlie's?